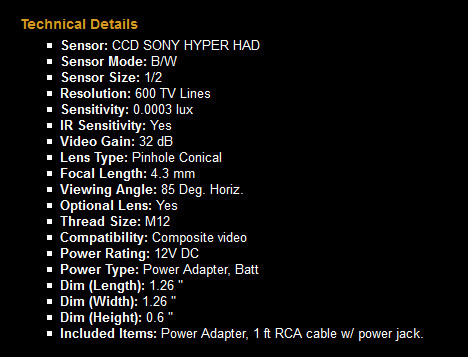 Low light capability of a camera is determined by its CCD size, lux rating & video gain in dB. Lower the lux, more the camera is sensitive to a light and higher the gain, better under low light with minimum loss of resolution. The gain is at the highest with 1/2" CCD cameras. 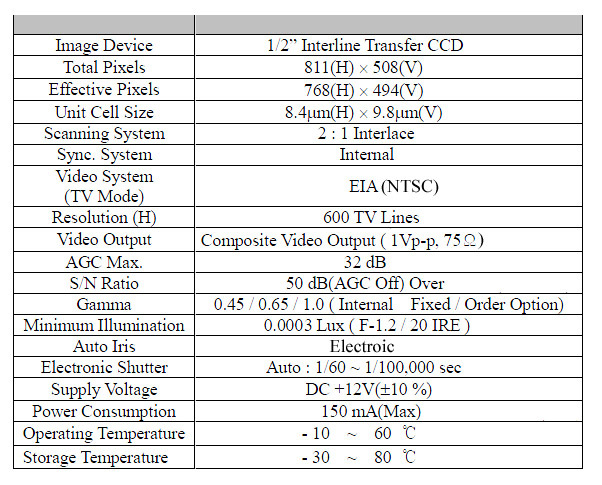 1/2" CCD cameras are also extremely sensitive to infrared illuminators. Even under total darkness, 1/2" CCD cameras can see the room like a day if infrared illuminators are used together. 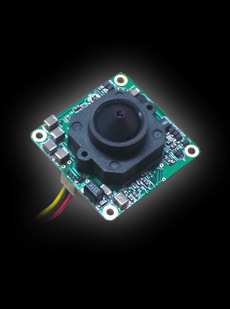 The B/W 0.0003 Lux, 1/2in CCD Star Light, High Res, Pinhole Board Camera / offers support for a TV, VCR or DVR and can be powered with an optional External Battery Power unit. It also features a B/W Camera. Are you interested in this B/W 0.0003 Lux, 1/2in CCD Star Light, High Res, Pinhole Board Camera / Pinhole Camera but not sure what's required for setup, how it works or you just have a general inquiry? Chat with one of our Pinhole Camera Specialists.